(Newser) – California and several other Democratic-led states announced they were challenging the Trump administration's effort to set up obstacles for women seeking abortions, including barring taxpayer-funded family planning clinics from referring patients to abortion providers. 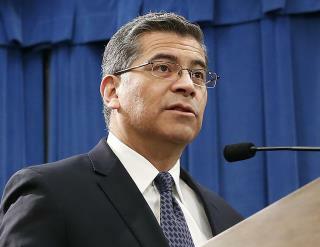 California Attorney General Xavier Becerra announced Monday that the state filed a federal lawsuit in San Francisco that aims to block a new family planning rule from the US Health and Human Services Department, the AP reports. The rule shifts millions of dollars from Planned Parenthood to faith-based family planning organizations. Washington, DC, and a coalition of 20 states said separately that they will file a lawsuit in US District Court in Eugene, Oregon, Tuesday, the Washington Post reports. 21 States Suing Over Trump's, well Trump's every word. This isn't news this is the Demoncats MO. It's what they do with taxpayer money. You'd think tjat the AG of California would be investigating Calif's Great Train Robbery of 5.4 billion dollars. That would wipe out the current Governor and Kamaltoe so he'd just as soon spend his time worrying about slaughtering the innocents. These are the same lawmakers that would kill a child after it survived an abortion attempt. So..they can just eff right off with this BS. The Demons have doctors lined up to kill fetuses, perform partial birth abortions and even birth babies now. They are so proud of their accomplishments including the right of any parent to interfere with their child being raped and made pregnant and taken control of by Planned Parenthood.